The Russian government has said the UK's attempts to "distort facts" in the British Council row has done nothing to defuse tensions between the countries. The council has suspended work at two Russian offices saying staff were being harassed by the security services. The UK's foreign secretary said the actions were "blatant intimidation" and "not worthy of a great country". But the Russian foreign ministry said he was attempting to "politicise" the row with "negative rhetoric". It is the latest development in ongoing tensions between London and Moscow that began with the murder of former KGB agent Alexander Litvinenko in London in November 2006. The Russian authorities say the British Council offices in St Petersburg and Yekaterinburg are operating illegally and have accused the council of violating Russian tax rules. They ordered the closure of the two offices in December, but Britain refused, saying they had done nothing wrong. Foreign Secretary David Miliband said on Thursday Russia had "failed to substantiate" those claims and had "resorted to intimidation" of Russian nationals working for the council. Some staff were summoned for interviews with Russia's FSB security service on Tuesday. Others were visited at home late at night by the tax police and questioned, according to Mr Miliband, on issues "from the institutional status of the British Council to personal questions about the health and welfare of family pets". He told MPs on Thursday: "We saw similar actions during the Cold War but thought they had been put behind us." He said the Russian Foreign Minister Sergei Lavrov had made it clear that the "attacks" on the British Council were linked to the Litvinenko case. But in a statement in response, Russian foreign ministry spokesman Mikhail Kamynin said: "Announcing the suspension of operations by the British Council in St Petersburg and Yekaterinburg, the British side has finally done what it should have done long ago." He added: "Attempts to politicise this theme by the British side, to distort facts and resort to negative rhetoric, are not helping to improve the climate of our bilateral relations in general." The UK wants Russia to hand over businessman Andrei Lugovoi, whom UK investigators suspect of murdering Mr Litvinenko - he died after being given a fatal dose of radioactive polonium 210. Russia refused to extradite Mr Lugovoi, now a member of the Russian parliament, so Britain expelled four Russian diplomats - Moscow then expelled four British diplomats. 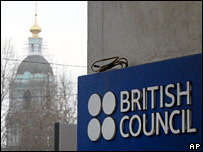 Russian officials have told the BBC the action against the British Council was a retaliatory measure.